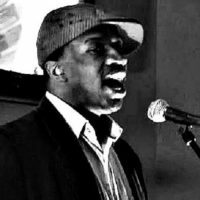 Editor’s note: The following poem was read by the poet at a May 19 People’s World party, potluck and fundraiser celebrating international labor solidarity and the fight for immigrant rights. Held at Chicago’s Unity Center, which houses the website’s editorial offices, Artemio Arreola from the Illinois Coalition for Immigrant and Refugee Rights spoke on the current struggle for immigration reform. Musicians performed traditional songs from Vera Cruz, Mexico, called Son Jarocho. The event, emceed by Melissa Parks, director of a low-income energy program at Unity Center, ended with Ethnic Dance’s Paul Collins leading audience members in group folk dances, from countries such as Turkey, Bulgaria, Bolivia and the United States (scroll to end to see video). my city and even my country. that is getting smaller and smaller. know. This helps us grow. is critical (that) we come together and share. Mi tierra es tu tierra. Mein Lan ist dein Land. Nchi yangu ni nchi yenu. one another. We share our cultures. 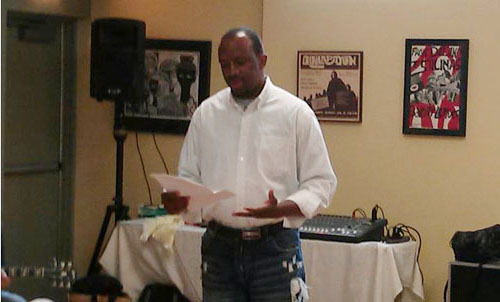 Photo: Christopher Sims reads Multicultural Soup at People’s World solidarity event (PW/Earchiel Johnson).